Rajan Bhattarai, one of Oli’s trusted aides, denied there was a secret last week to make Dahal PM. 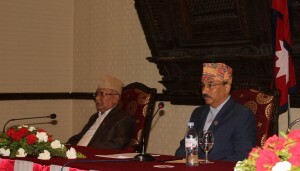 “Dahal backed off not because Oli promised him prime ministership but because he realised it was not possible to forge a ruling coalition with the NC and Madhesi parties,” he said. But sources say it was initially mentioned in the UML-Maoist deal that Oli would resign and back Dahal to become the new PM after the budget. But Oli argued that people would not believe in his government’s policies and programs after such a deal, and both sides agreed to reword this sentence. They instead wrote that a government of national unity would be formed to implement the constitution. New Delhi appears determined to break the communist coalition which it believes was masterminded by Beijing. Former Indian ambassador KV Rajan is learnt to have secretly met UML leaders, including Madhav Nepal, to break the UML-Maoist partnership. Oli is convinced India wants him out and in retaliation cancelled President Bidya Bhandari’s visit to India and recalled Nepal’s ambassador to India, Deep Kumar Upadhyay. Look at Brazil, coups are fashionable. This coalition is nepalese stable. Enjoy. It is not about government rebuilding, they lacked confidence or have too much. What about jobs and rebuilding? Stability is good, the eoncomy needs clear measures in sustainable development and usually cooperation is good, renovating airports is good, resolving troubles in Terai and Madhesis for once. Most people did not know about the Constitution before it was celebrated. But they danced and got drunk. People are not stupid, a solution for mashes is more important than ego. And previous governments commission made the write up. Why pursue inequality in the 21 century? think about clean air in Kathmandu and things for the future. Give the people new micros and buses, prohibit old cars, something content level than just Baburam and the same old people. Disgusted with politics.